Located in beautiful rural New Zealand on a working farm of 65 acres, this award-winning luxury country lodge offers two architecturally unique rooms to guests. 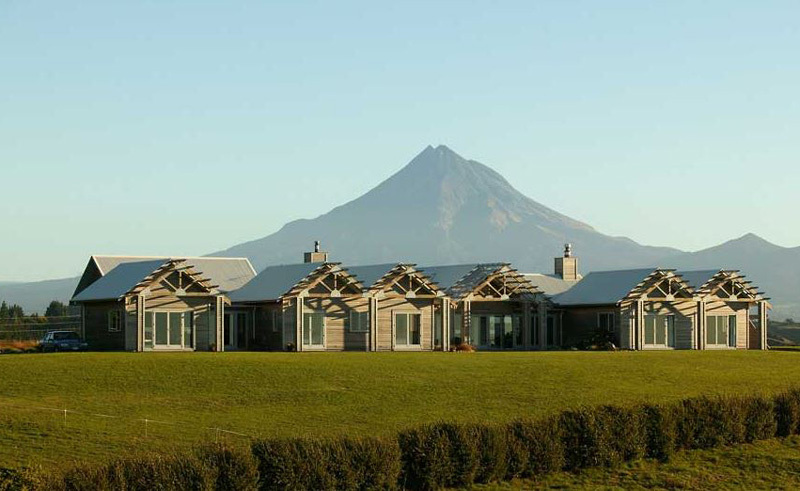 With spectacular views of Mount Taranaki and the North Coast, this is a marvellous place to relax and enjoy some of New Zealand’s world-famous scenery. Only twenty minutes from New Plymouth, you are well-placed here to access the restaurants, cafes and amenities of the city while savouring the quiet of the rural North Island. The hotel’s lounge is a magnificent place to relax, while the younger in the group may want to tour the farm itself, learning all about the art of food production. An area of renowned scenic beauty, helicopter tours come highly recommended and can easily be arranged. The two rooms are spacious, each offering a super-King size bed, refrigerator, TV, en suite facilities, patio area and tea and coffee making facilities. A full breakfast is available, giving guests a filling start to their day of sightseeing.